On their mission to find only the most exotic ingredients for top-notch dishes, Rutabaga and his pet cooking pot, Pot, somehow manage to get themselves into a series of pickles. 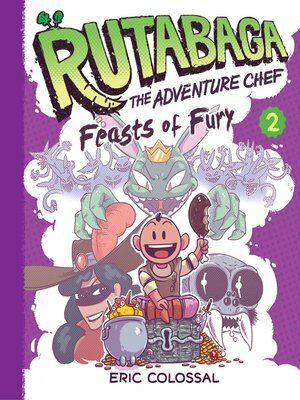 Amid the giant killer spiders, a desperate acting troupe, a nefarious thief, and a horde of toxic gubblins (nasty, goblin-like creatures) who threaten to take over the kingdom of Evanore, how is Rutabaga supposed to find any time to cook? Filled with the first volume's same brand of humor and high jinks, this installment takes readers to new locations in the fantastical world Eric Colossal has created and showcases more out-of-this-world platters that "Ru" brings to life. As in the first book, in the back are three safe, easy-to-make recipes for all ages.